Fin.a.lly! This project of transferring a photo onto four different canvases seriously has taken me week, but finally it's done and on the wall. Don't get all intimidated - it was basically user error. I ran out of printer ink...bought two different cartridges and then had to return them both and finally I got the right one. 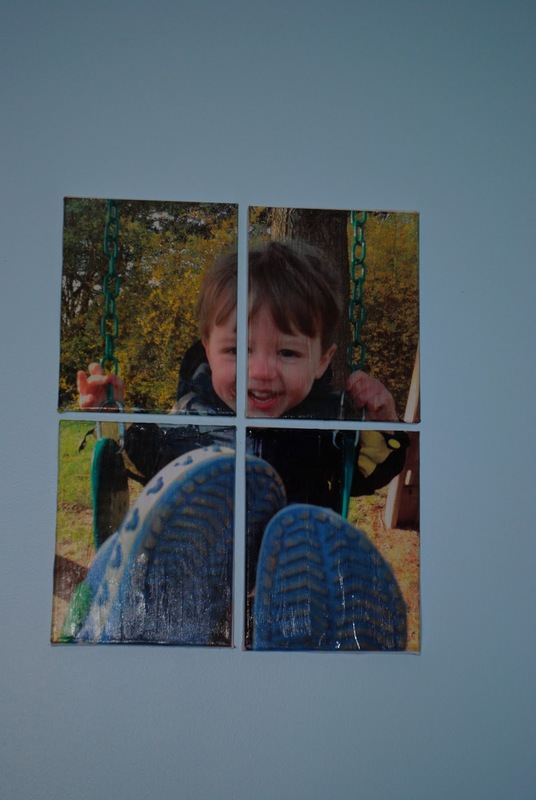 This all go started because I had this awesome picture of my son that I wanted to display. I also had four 8x10 stretched framed canvases just sitting in my craft room waiting to be put to use. Ta-da the perfect combination. Originally, I made the four canvas pictures black and white, but I was not happy with the result so I basically had to start over. Since I had already mod podged the black and white photos to canvases I literally just mod podged the color version over top them. But let's not get ahead of ourselves...first things first. I actually took this shot of my son on my iPhone. I uploaded the picture to my computer. 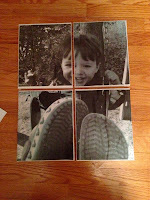 Then I imported it into iPhoto and divided the picture into quarters. I then cropped it into four equal sections - one for each quarter. To do this you need to make four copies of the original picture and then use the crop tool. After I had the four saved versions, I attempted to print each photo. Call me simple, but I couldn't figure out how to get it to print without a border. That was part of the problem with the black and white print outs, they had too much of a border on them and it was too obvious on the canvas. So what did I do? Of course I turned to my trusty PowerPoint. I turned the photos back to color before uploading the cropped photos, that I had saved from iPhoto, into Powerpoint. I put each quarter on its own PowerPoint slide. 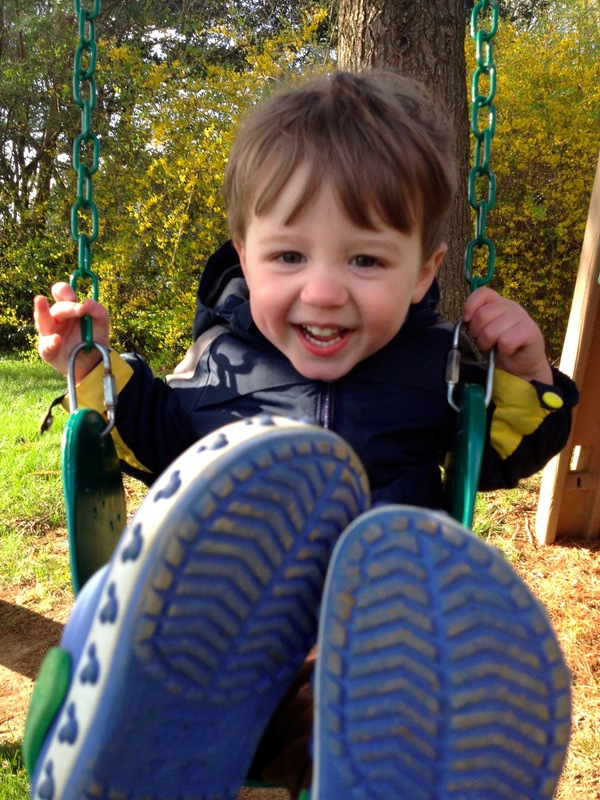 Make sure your PowerPoint slides are in portrait view and not landscape if you have a portrait photo like I did. You can leave it in landscape if you have that type of photos. 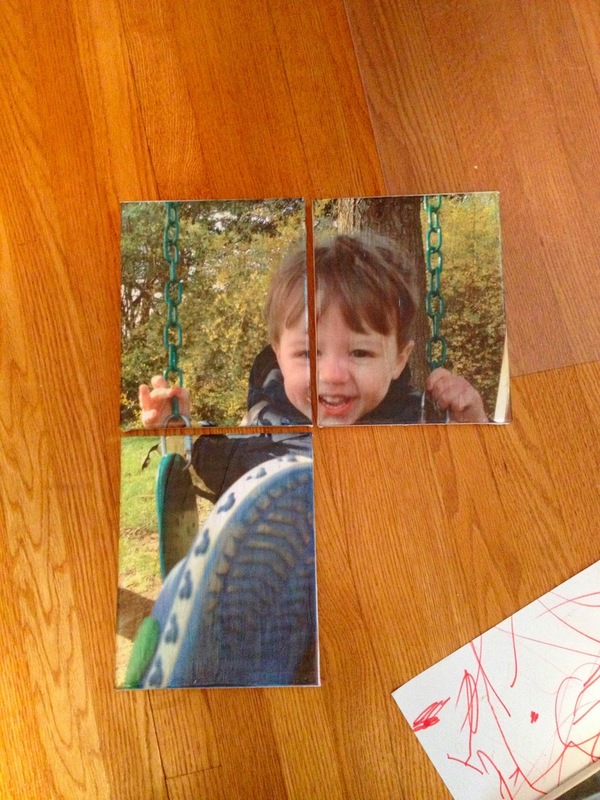 I then stretched the photo on each slide so it covered the entire slide area. 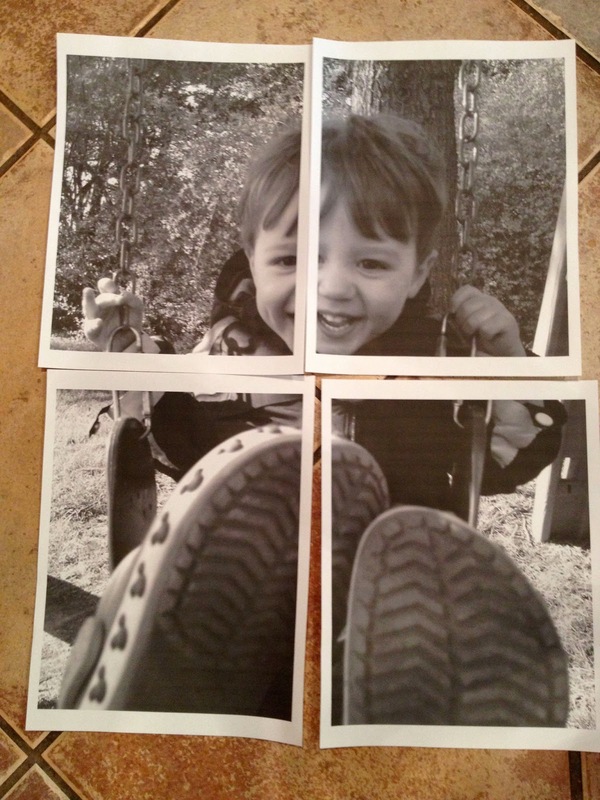 It may look like it covers the entire slide, but you still have to go into the print options and select "no border" to ensure the photo is printed on the entire sheet of paper. 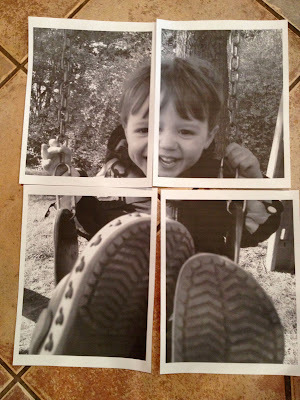 This is why I ran out of ink I was printing repeatedly until I figured out that "no border" thing. 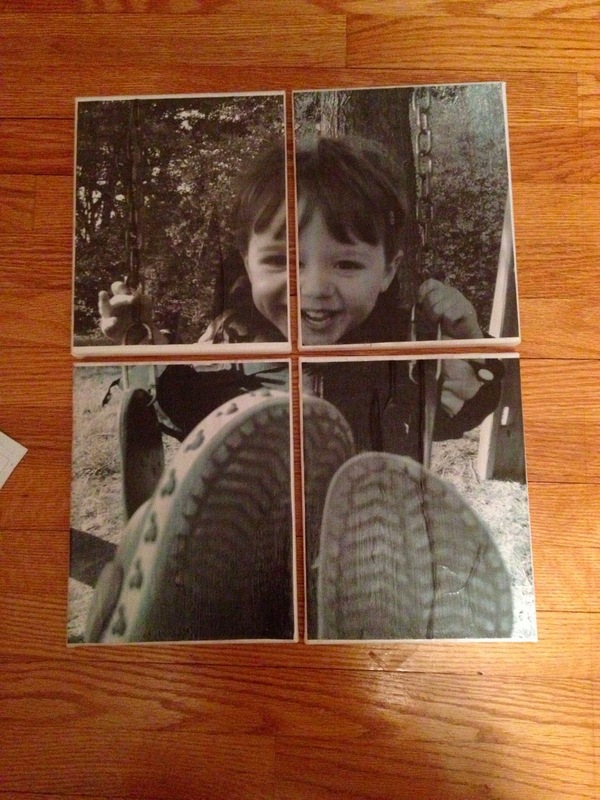 Once I printed out all my photos on plain ol' white printer paper, I used a foam brush to spread a layer of mod podge on the canvases (which already had the black and white print on it). It's best to work with one canvas at a time so the mod podge doesn't start drying on you. Then I laid my colored 9x11 copy on top and folded over the edges onto the side. You may need to trim some of the excess paper off with scissors, but I found the canvases looked better if they had a little of the photos spilling onto the sides. 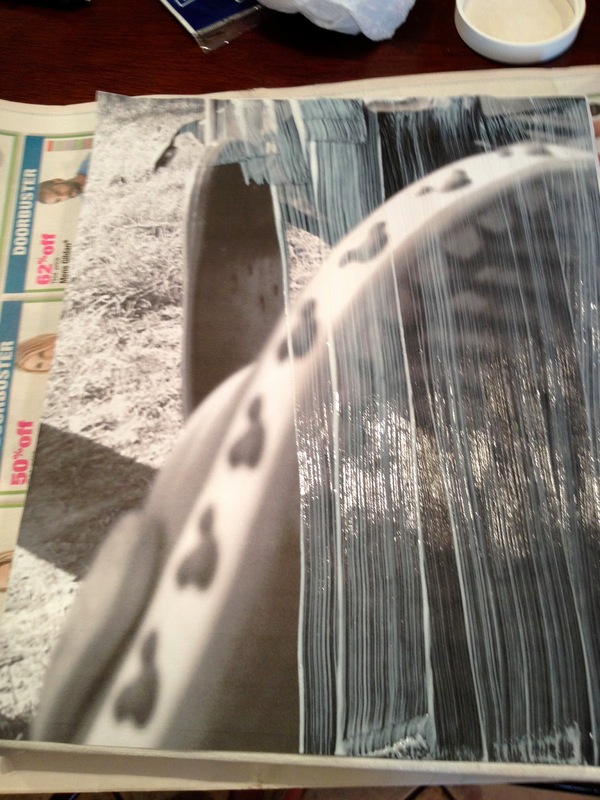 Once I had the photo on the canvas I spread another thick layer of mod podge on top. You want it to be pretty white. Don't worry - it will dry clear. Try to get as many of the air bubbles and wrinkles out as you can. I'll admit, mine are a little bumpy, but on the wall it looks fine. I then repeated this step with the other three canvases. Make sure, if you have things that need to line up exactly, like I did with the swing hooks or my son's eyes, that they do so before you mod podge. If it's not exact it's okay because once you hang it on the wall there will be a little gap and it won't be super noticeable if it's a little off. That's it! Now hang on the wall and enjoy. Whew..that was seriously a close call between the ink issue and the black and white mess up - but I love it when I can save a project that I'm pretty sure is nearing the point of no return. 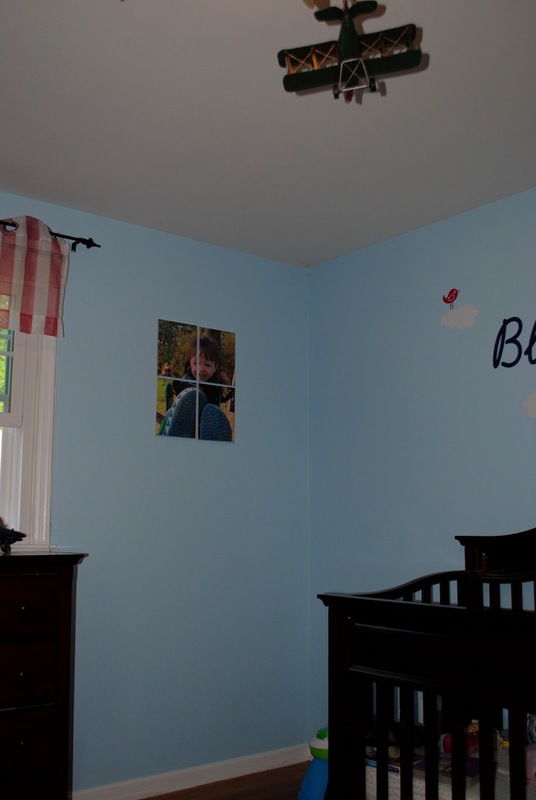 Note: I used the gloss mod podge for this project. Thanks for reading 2IY and if you like what you'd see we'd appreciate a Pin, a "Like" or a shout from the rooftop.